There was this brief moment where we thought we might get to go home today… however it has been moved until tomorrow. Momma is fine with that though!!! We are going HOME AGAIN!!!!! EEEEEEEEEEEEEEEEEE!!!!! I’ll wait one more day for home… it is so totally worth it! Thank you Thank you THANK YOU Jesus!!!!! She continues on a steroid taper, and they’ve decided to leave her on a dose of steroids just in case she IS rejecting for at least a month to two months. This also helps her chronic lung disease, so serves two purposes. Please pray that this HELPS and that there are no bad side effects. One side effect, at the moment, is that she isn’t napping well and gets irritable sometimes. Momma is trying not to worry about low heart rates. They are a side effect of the steroids, but where Annabelle’s norm is 120’s to 130’s, she has been sitting in the 90’s the last few days. Last night, she even got into the high 70’s and gave Momma a big scare. Cardiologist says this should improve as we taper to a slightly lower dose over the next week. Momma hopes so, as 70’s are WAY to close to 60 (at which point in baby’s you do CPR to get the heartrate back up.) Please pray that they stay in a normal range so Momma doesn’t have coronary issues! Her oxygen saturation are GREAT! We are on a 1/2 liter but could easily go to 1/4 of a liter and probably even less, as when the cannula comes out of her nose, she is only dipping to high 80’s/low 90’s, which is GREAT for Annabelle! SO THANK YOU JESUS!!! Her echo today wasn’t “quite” as good as the last one, but it is comparable to the last echo we had in clinic, so is still technically good. Not sure yet if this is a prayer request or a praise… but just a Hmmmm for now. At the moment, they are still unsure if they will start medication for high pressures in her lungs. To know for sure if the pressures are high, I think they’d have to do a cath, and no one wants to do that at the moment. Right now, they haven’t started it, and I’m praying really hard we don’t have to! But if she needs it, we’ll do whatever we have to. Still no real idea of what caused our issue… 9 days ago now?? It’s a little scary to go home with this ? as to what went wrong, but we’ve started a few new meds to help, and I feel like I’m armed with more information and will be better at reading signs now that we’ve had one scare. 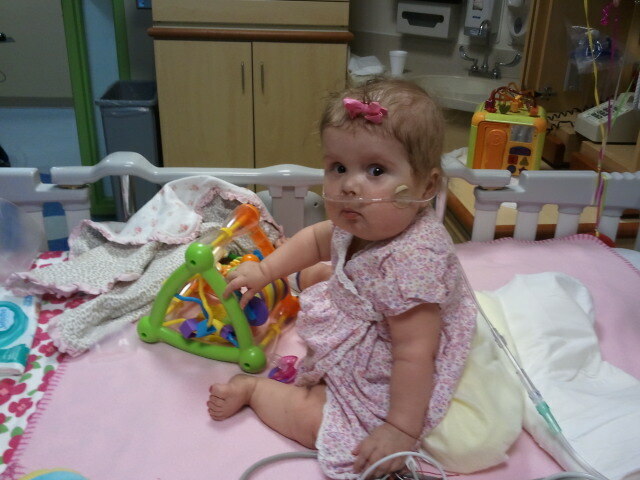 Annabelle is SITTING UP!!!!! Like… REALLY good! Before, she would sit up for a max 30 minutes with the help of her boppy pillow, but by herself, no more than 30 seconds or so. Now, this morning, she sat up for almost 2 hours with NO help, just playing with her toys! The pics are from the last two days, but suffice to say, she is doing GREAT at her new situp trick! Look at me!!! I have a little zflow behind me but it’s not doing much. And now I’m REALLY doing it it ALL BY MYSELF!!!!! LOVE this toy at the hospital… it is one of my favorites so Momma is gonna try to find me one similar once we get home. It has lots of twirly things that I can make go-go-go! Great news, and I love to see her sitting up so well! birthday. I will be 67 years old. She looks so cute sitting up! I mean, she looks cute all the time, but it's nice to see her sitting up all by herself. Such a big girl! How cool that the two Annas got a picture together (and with their Momma's too!). So happy to read this post. Love the picture of her sitting up all by herself! Will continue to keep you all in my prayers. Oh my goodness, I can't believe how BIG she looks sitting up! So precious. 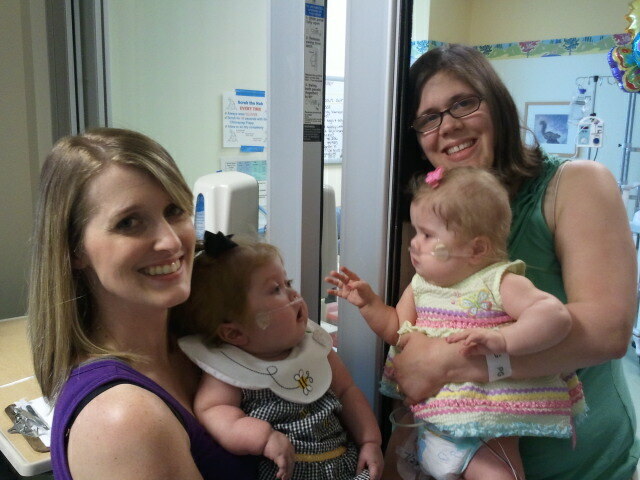 And how sweet that the two Anna's got to meet (and get to go home soon)! Such wonderful news! I'm so glad know Annabelle is going home (and that her friend, Anna, has went home, too). Just loved the pictures of her sitting up! It is such a wonderful feeling when they hit those milestones, (especially when they had to overcome more obstacles to get there). So glad you'll be home-bound soon.